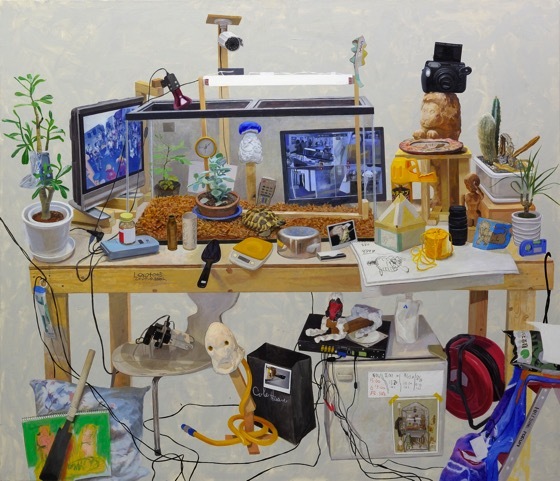 Museum of Contemporary Art Tokyo is celebrating its twentieth anniversary next year, and Contacts is the second of three special exhibitions marking the anniversary with their collection. Each of the exhibitions is organized under different themes. This term, Contacts highlights on new connections between diverse artworks and artists. The Contacts exhibition is spread throughout two main floors of the museum, divided into fourteen sections. 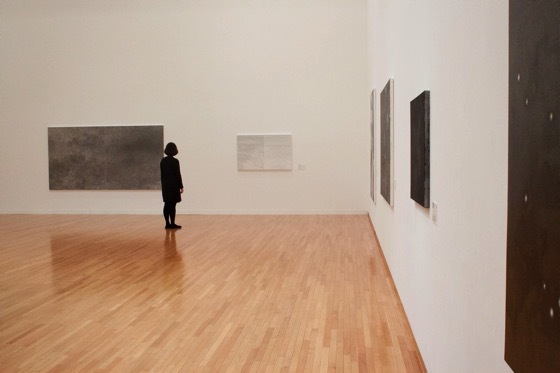 In each section, artworks from postwar to contemporary periods with different genres, generations and methods are combined to provide a unique experience only possible in its space. When viewers enter the exhibition, they first encounter layers of ‘sounds’ played in the museum’s iconic atrium. In this large atmospheric open space, sounds echo and reflect; creating a strange yet speculative symphony. This is the space where visitors can experience works through various senses. Saburo Murakami’s “Work” appears to be rusty wooden box our naked eyes, however when it is ‘listened’ carefully, we can hear the box ticking repeatedly, which reveals to be a grandfather’s clock; what sounds like our heartbeats allows us to oddly familiarize with it. 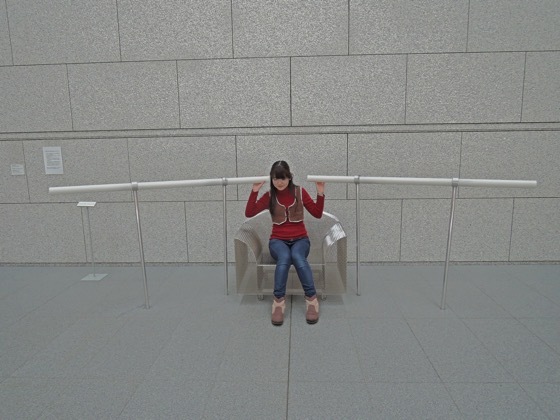 Yukio Fujimoto’s “Ear With Chair” is also an installation work with invisible features. It has two components; a chair designed by Kuramata Shiro and meters long pipes which audience can place their ears onto. It is an incarnation of the artist’s wondering idea; what if the shape of human ears were like long pipes, and what kind of sounds can we hear from them? Such genuine questions drove him to create this particular work which could be seen, listened, and seated. In the room titled “Sculpture and Painting”, we can experience the combination of solemn beauty of a sculpture by Shigeo Toya and quiet and melodic paintings by Naoko Sekine. Toya’s “Death of the Kilin of the Elephant of the Wood” positioned in the center of the room floor instantly captures the audience’s attention. The artist explains this work as ‘a sculpture representing structure of the forest’, and the forest is an interfacial space between the ground and the sky. By following its overwhelming size and complex textures on the rough surface made by a chainsaw, the viewer becomes a part of its subject, lost and searching, as though as they are in a forest. 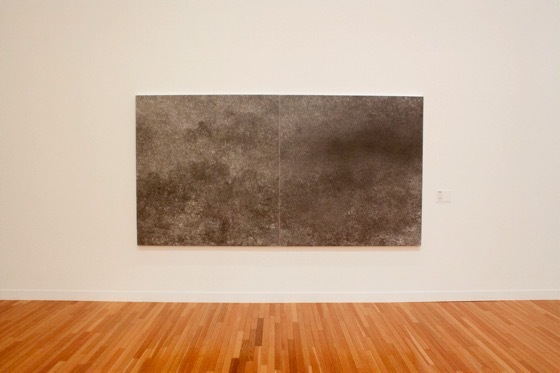 In contrast, Sekine’s paintings are almost silent. They quietly wait on walls, mesmerizing us to enter into her mellow world. These paintings are created with layers of line drawings. Likewise Shigeo Toya, Sekine decides her lines as she progresses without a solid compositional image and planning, and those monochromatic and unreserved lines evoke us to think about nature. Sekine is also taking part in the 17th Domani; Art of Tomorrow exhibition at The National Arts Centre, Tokyo, where she discusses her encounters with ancient cave drawings during her stay in France. She explained how those drawings were applied on the pre-existing surface and simply not drawn as ‘images’, provoking her to think how primeval inhabitants could see cows and people in shadows and shapes of the stone surface, as we do with clouds in the sky and ink smudges on paper today. Such encounters where one can experience the sources of the most primitive senses are the inspirations to both artists continuing their practice. In the space “Sculptural Experience”, a collaborative nature with works of two artists is remarkably significant; “Gold Finger” by Motohiro Tomii was particularly made for the Contacts exhibition to collaborate with “Twenty-Second Steel Cardinal” by Carl Andre. 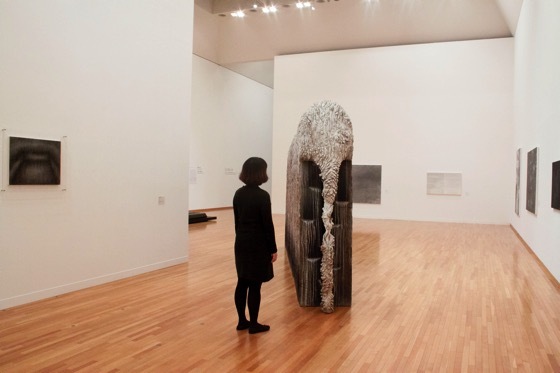 Both artists’ practice looks in material and political aspects of sculpture. They both are created with sets of rules and systematic positioning and patterning, and are made of such industrial materials as steel and everyday materials as push pins. They comment on a conceptual relationship between art and labour to question where sculptural value lies. 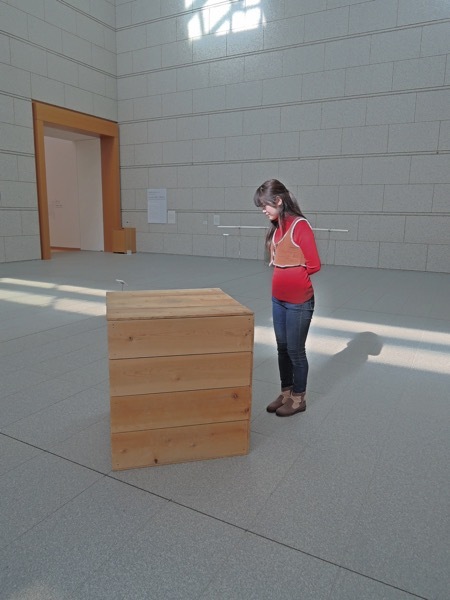 Carl Andre thought sculpture as an expansive art form, from its ‘form’ to ‘structure’, then its encompassing ‘space’. 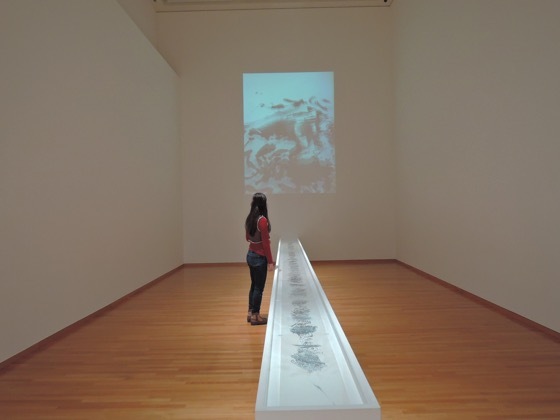 “Twenty Second Steel Cardinal”, composed of twenty-two steel on the floor, is a piece which provides an unconventional viewing experience; as viewer becomes aware of their body and position by stepping on steel panels, the work progressively completes itself. 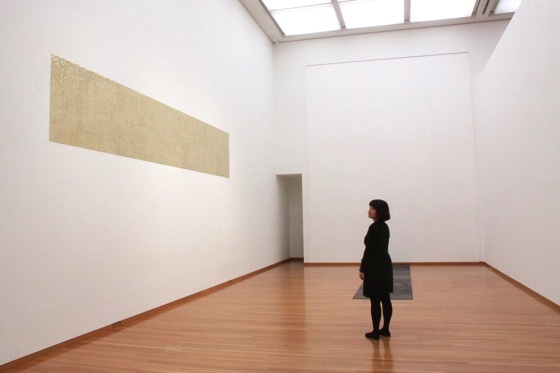 “Gold Finger” by Motohiro Tomii is a flexible series which shifts its size and ratio for each exhibition. For this particular occasion, Tomii decided to recreate the work equal to the size of “Twenty Second Steel Cardinal”, and install it vertically on a wall, contrasting with Andre’s horizontal installation. 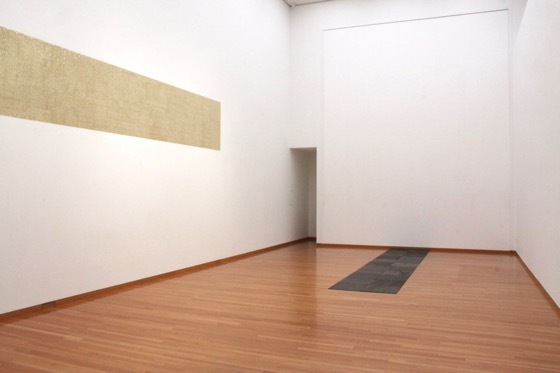 “Gold Finger” by Motohiro Tomii exhibited on the wall and Carl Andre “Twenty Second Steel Cardinal” (1974) on the floor. They are actually in the same size. In the last room of the exhibition, viewers are introduced to the Dynamism of paintings by Sam Francis and Takashi Ishida. Ishida’s “UNASAKA”, the sea slope, was produced over three weeks. Nine meters long scroll painting was done inch by inch, gradually pulled over to be painted. Every shot was photographed by a camera fixed at the angle and on the eyelevel of the artist to be animated. 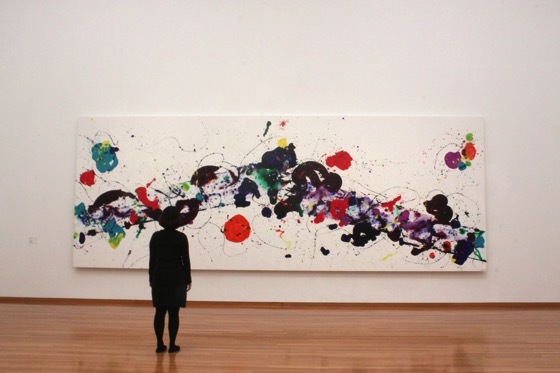 In the final result, it displays a record of the creative process; the black line advancing towards the edge looks as though it is travelling over the sea slope. 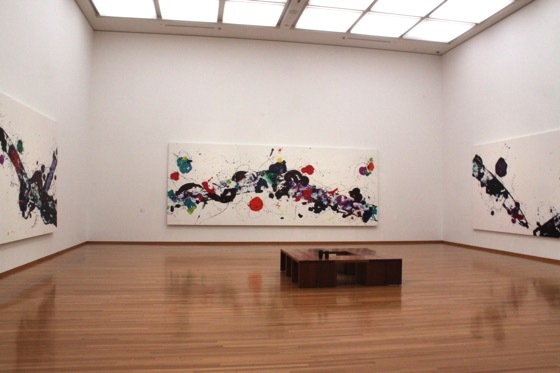 In the next room to Ishida’s monochromatic animation, viewers encounter vivid colours of Sam Francis’s painting series surrounding brightly lit space. These three paintings embody artist’s interactions with canvases and acrylic paints rather than working on concepts. The canvas is ‘an arena in which to act’ as a postmodern art critic, Harold Rosenberg once said, for Francis, painting was a living form. It absorbed him as a part of itself, and could never be fully understood until the very end. This series goes over the boundary of the canvas to freely express such impulsive vibrancy and energy through lines and colours. The Contacts exhibition provides the joy of ‘realisations’. It is the revelation of each work’s potentiality; the collaboration unfolded and extended its hidden quality. It ‘contacts’ and bridges the viewers and the museum collection, artists and artworks, lines and colours, sculpture and painting and whatsoever that lies in-between. Throughout the journey of rediscovery, viewers can enjoy the new values and connections created between the works from various time periods and media. * On Jan 2 and 3, 2015, visitors can enjoy this exhibition for free admission.